Senior Evan Troike makes the inbound pass to senior Caleb Muia late in the third quarter Friday as Girard boys would go on to defeat the Vikings 72-65. The Girard Trojans boys’ and girls’ basketball teams tipped off their season with an away game against the Parsons Vikings Friday night. During the girls’ game, Coach Brad Herlocker deep into his bench on his varsity roster giving some of the younger players some experience. Being the first game of the season, there were moments of shaking off the rust for the Lady Trojans as turnovers were prevalent throughout the game. Initially, both teams came out slow offensively and did not produce many points. Parsons stifling press defense gave the Trojans trouble in the first quarter forcing turnovers and not letting Girard get any good looks. But Girard quickly adjusted as they allowed Parsons to only 3 points in the second quarter. Throughout the game, Girard’s tandem of senior Drake Worrell and sophomore Jaada Valley took charge as Worrell finished with 9 points and Valley finished with 10 points as well as a handful of steals. With numerous young varsity players on the court this year for Girard, an adjustment period is to be expected. The Girard girls showed the potential to be a solid team as they learn to work together. The Lady Trojans ended up defeating the Parsons Vikings with a score of 46-40. In the prior season for the boys’ team, there were questions regarding on how they will play with such young players. But this season is a different story as the Trojans are led with senior leadership. In the first, Girard went deep into their bench as Parsons did the same with both teams consistently bringing in fresh legs. Girard came out on top in the first quarter, forcing turnovers and scoring on those opportunities. Senior Caleb Muia took charge after the first quarter scoring a heavy load for the Trojans throughout the game. But Girard gave up opportunities in the second quarter which led to Parsons taking the lead before the half. Both teams came out with an increased sense of urgency in the second half and focused more on defense. From there on out, it was a battle to see who could penetrate the other’s defense. Senior leadership played a key role in the second half as Muia and Evan Troike controlled the tempo for Girard. Troike would soon experience back troubles near the end of the third quarter which would pay dividends for the Trojan’s. Girard maintained the lead for most of the game but here came the Vikings. With 32 seconds left in the game, Parsons was down just one point. 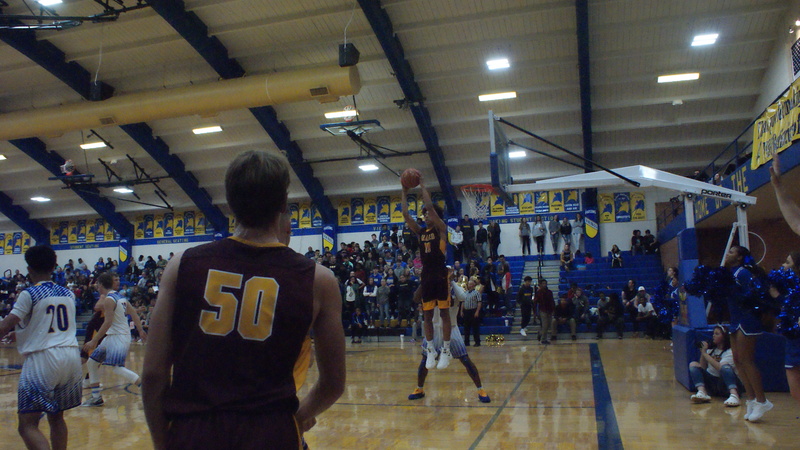 Caleb Muia was then fouled where he misses the first then made the second giving Girard a two-point lead. Due to the quickness and length of Parsons, the Vikings forced an overtime. In overtime, it was all the Trojans as injuries riddled the Vikings. 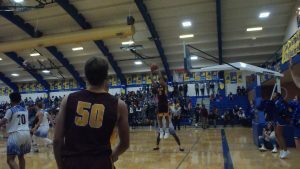 Girard’s fast-break offense proved to be too much for the Vikings as the Trojans went on to win 72-65. Senior Caleb Muia dropped 33 points, leading Girard to a 72-65 win over #2 Parsons in their season opener. “Really happy with our efforts thought our guys played their toes off tonight, some things we are going to have to clean up but I’m very pleased with our performance,” said boys’ coach Rod Wescott. The Trojans will be at home next Tuesday, Dec. 4, in hopes of continuing their hot streak against the Liberal Bulldogs.